The General Assembly of 1979 designated the box turtle (Terrapene carolina) as the official State Reptile for North Carolina. (Session Laws, 1979, c. 154). The bill to adopt the Eastern Box Turtle as the official state reptile was sponsored by Rep. Chris Barker of New Bern. Barker began his campaign at the house committee in February of 1979, where he distributed turtle lapel pins and memberships in the Turtles International Association. He claimed the turtle was the best representative of North Carolina because it’s a useful creature that controls insect levels, clears ponds and lakes of impurities, is edible, and is the ultimate example of patience and North Carolina’s unrelenting pursuit of goals. Though Barker’s initial bill was on behalf of all turtles, his fellow representatives convinced him to select a single species. Barker selected the Eastern Box Turtle because it is common to all parts of the state. The bill then moved to the House of Representatives where it came under considerable debate. Male alligators, lizards, and snakes were proposed as alternatives by various congressmen. Rep. Horace Locklear of Robeson County took the floor to give a tribute to the turtle on behalf of the state’s Native American population, who historically used the turtle for pets, medicine, musical instruments, and food. The bill eventually passed in the house with a vote of 102 to 4. The bill was approved by the senate committee in March of 1979 after a turtle demonstration by 12-year-old Sid Mitchell of Cary, who brought two of his seven pet Box turtles to share with the legislators. The bill was in the senate with little fanfare, though one senator voted no because he didn’t think the turtle was a good representation of North Carolina’s Progressiveness. Nevertheless, the bill became law on March 19, 1979. Box Turtles are found all across North Carolina from the mountains to the coast, although they are not common on the Outer Banks. They are generally small with a distinctive domed shell that can be brightly colored, and they can live up to 25 to 30 years. We see them from forests to fields and often in our neighborhoods. The Box Turtle got its name from its ability to box itself into its shell when it senses danger. See also Eastern Box Turtle. are the abode of many species of turtles; Now, therefore. . ."
More information about the Eastern Box Turtle is available in the Eastern Box Turtle article from the NC Wildlife Resources Commission. Associated Press. "Turtle wins final approval as state reptile." Wilmington Morning Star. March 17, 1979. 7-C. http://news.google.com/newspapers?id=XsksAAAAIBAJ&sjid=MxMEAAAAIBAJ&pg=4868%2C3697108 (accessed October 7, 2013). Bond, Sharon. "Turtle Gets The Nod From State House." The Dispatch [Lexington, N.C.]. March 1, 1979. 12. http://news.google.com/newspapers?id=Y1UcAAAAIBAJ&sjid=p1EEAAAAIBAJ&pg=7138%2C6079886 (accessed October 7, 2013). Harden, Leigh Anne. "Meet our State Reptile, the Eastern Box Turtle." North Carolina Herpetological Society. 2006. http://ncherps.org/state-herp-symbols/ (accessed October 28, 2014). I need help! Can I have some links? Hello. What do you need links about? I suggest using chat with a librarian at the top of the page for faster help. Okay! I guess I will try that. who named the state turtle please anwser soon!! Thanks for visiting NCpedia and for taking the time to share your question! That's a great question. 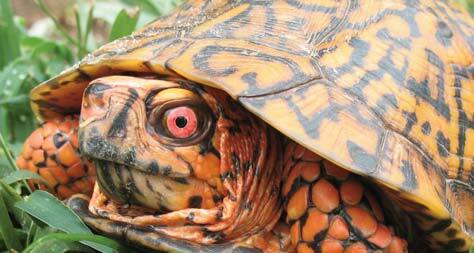 The Eastern Box Turtle was named the state reptile of NC by the NC General Assembly. All of NC's official adoptions and state symbols were selected by the general assembly and created by passing and ratifying legislation. Check out the paragraphs above where the article talks more about the legislation that created the state reptile. And let us know if you have more questions!